Life is not always what we want, but we can live better. There is no perfect life, but there are perfect moments. Happiness is a decision, not an experience. You can decide to be happy / to and without thought or what you think you need to be happy / to, and be happy ... only if you want. Your experience is the result of decisions, not because of them! 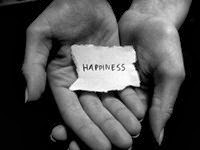 Everyone tries to give a definition of happiness, but the results are all different. At times I ask myself the question ... Does what is happiness?? The chapter answers, it's bad because there is no fixed definition. Each has a different meaning happiness. It is said that happiness consists in loving and being loved. It's a start on the wrong foot, because love is just one element of happiness, besides the multitude of elements that have the same effect. So happiness is not strictly determined object, it varies from case to case, as with most tastes are varied.